For the past few months, the kiddos have been learning about what it means to do a random act of kindness. A friend of ours, is in charge of her church's advent readings this year. As part of advent, her church is handing out stars each week. I sat with her a while and helped tie ribbons on some paper stars, and her mother made some beautiful crochet stars that you can check out here. 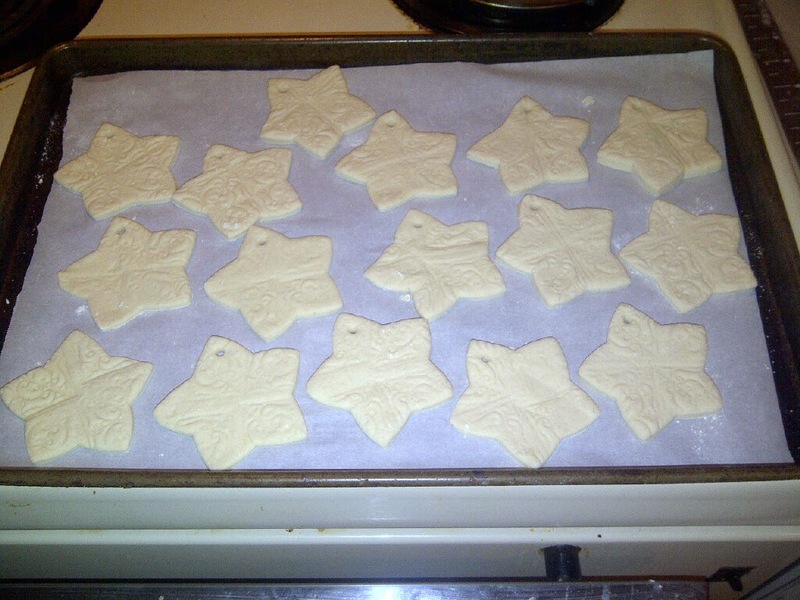 She mentioned making salt dough stars, and I knew that was right up our alley, so I was happy to volunteer. The kids and I had fun cutting them and painting them. And when Boy asked, "is this a random act of kindness?" I said, "Absolutely!" 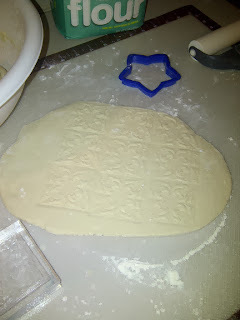 I took one of my clear stamps with a design and stamped the salt dough after it was all rolled out. 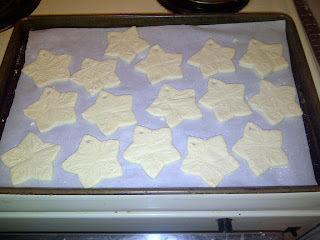 Then Bug helped cut out the stars and lay them on parchment paper on the baking sheet. 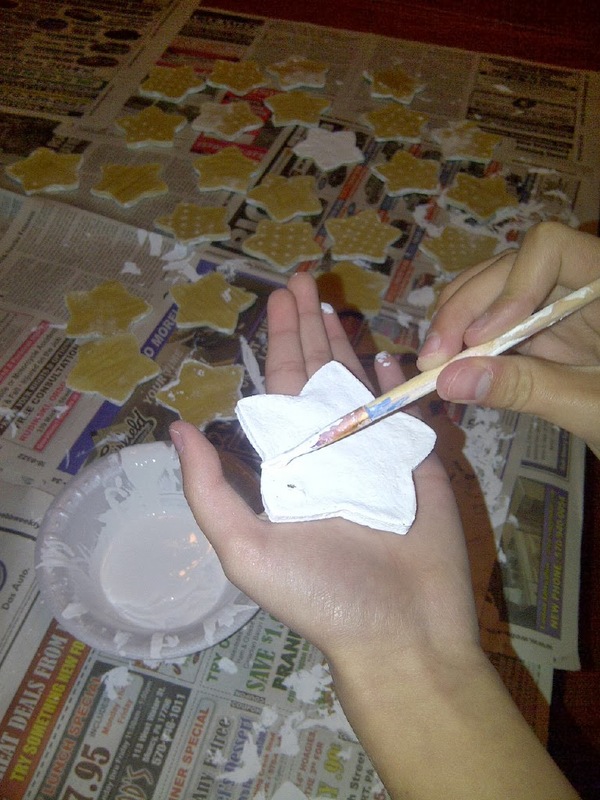 Bell, helped paint them, and decided it was best to do both sides so you couldn't see the "cookie" part. We took some red and white baker's twine and tied through them for hanging. They're so pretty on the tree. And we made quite a few of them. 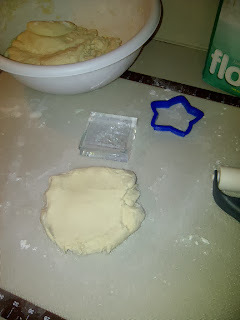 Salt dough is a pretty simple recipe that the kids can have a lot of fun with. The best thing I like about salt dough ornaments is if they break they're just dough -- no one gets hurt and they're inexpensive. Roll it out just like you're making sugar cookies. Bake them at 200 F or less for an hour then flip them and an hour more. (or you can just let them sit out for a day or two to get hard). Just remember, they're salt. I wouldn't advise a taste test when your done.